After croissants we visited the little Port de Plaisance on the canal at the other end of Rohan, then headed east to Josselin, one of two larger towns nearby. 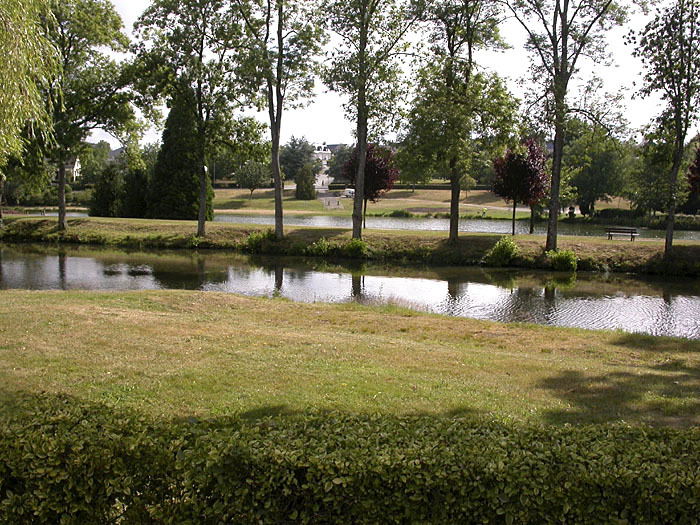 The canal also passes through Josselin just outside the walls of the Rapunzel-towers chateau there, and the tow-path next to the canal provides a great walking and biking path. There is a canal lock at the bottom of the hill where our rental was located, and another just under the chateau wall in Josselin. These canal locks are operated by hand and afford a lovely way to take a small boat all around France at a very civilized speed and under conditions of aesthetic perfection. The church square inside the town walls and ramparts provided the expected cafes with outdoor umbrellas and a varied menu. In honor of last year's visit to the Dordogne I had a salad with gésiers (duck gizzards), whileF chose a ham galette--a species of crêpe. We then drove south for nearly an hour to the south coast of Brittany to Vannes--a bustling port town full of Beneteau and Jeanneau sailboats. We walked a mile or two along the berthed boats, but never reached the sea. Then we headed home for more barbecued chicken, zucchini, and salad, with a good cidre brut and a bottle of Muscadet.